I dropped in at The Capital Hotel Monday late morning to shoot this particular special. There are specials going on all over the city during this special yearly promotion, and I'm trying to find the absolute best. I valet'd my car (I LOVE that about The Capital Hotel), walked in and was brought to a seat at the bar so I could give the special a try. You know something? I was in CBG the week it opened under its new branding in 2009, and very little has changed. Yes, food costs have gone up, that's everywhere - but from the gorgeous leather seats and walls to the blackwashed wood, it's still just as comfortable as the first time I sat down for a moon pie and root beer. I'd still take business guests here. Chef Marc Guizol delivered the plate himself with a smile and greetings - it's been a while since I've been able to darken the door at CBG - and asked me to consider the barbecue sauce. Of course, I happily obliged. So let me let you in on my thoughts. First off... I think this is the first time I've been served anything at Capital Bar and Grill that hasn't been on those old signature black-embellished rounds. This rectangular sandwich was served on an equally rectangular platter with a sheaf of hot fries (the special is served with sweet potato fries, but regular fries are an option). Second... this is made from blueberries? Yes, that's barbecue sauce. GOOD barbecue sauce. The sort that you'd overlook if you weren't thinking about blueberries, just assuming it was clean and solid and a good addition to the plate. But when you think blueberries and taste this sauce, you wonder why more people don't use blueberries in savory dishes. I will be back for THIS SAUCE. Third... that's a heck of a sandwich. Housemade sourdough bread. Thin sliced marinated brisket. Barely enough cheese to bind it. Everything looked amazing - the buttery grilled crust, the tint of spice in the meat. Just one thing to make it better. Slicing. See, the sandwich is so large, it's easier to handle this way. Oh yes. Oh very much yes. Because this is where I dug in. And I realized I was ruined for barbecue anywhere else the rest of the day. 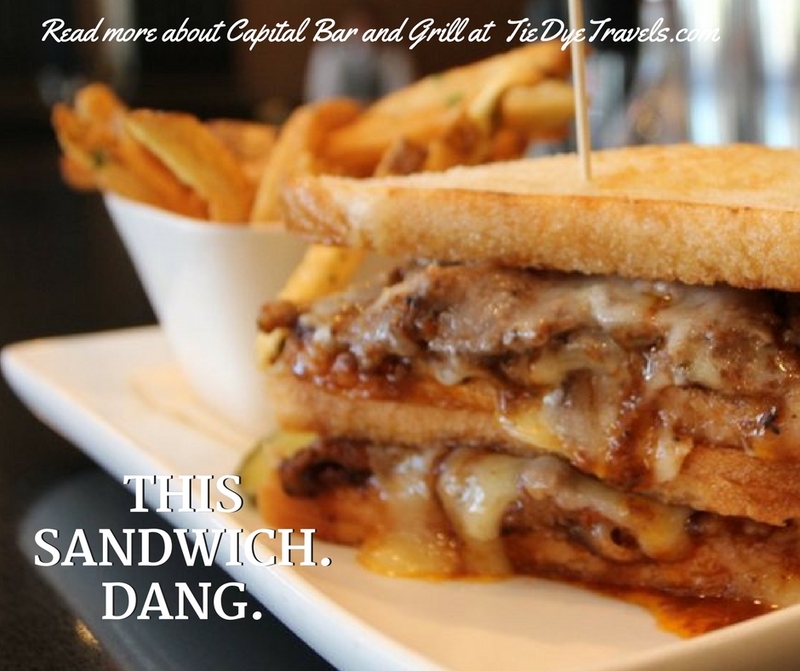 Because what we have here is an amazing, balanced barbecue beef sandwich on toast. It wasn't too greasy. It wasn't too spicy. It was... it was very satisfying. Good notes all throughout. Of course, my barkeep would also insist I try the truffle sauce too - a Bearnaise with truffle infusion. Oh golly. No, no photos of that. I was done. I was so done and not thinking anything else. I'd come in to photograph a sandwich and some fries. I left feeling stunned by how ridiculous that plate was - and remembered again why the Capital Bar and Grill has been my go-to for bringing fellow journalists to Arkansas. It's not just the bar menu - which could be the best in the state. It's not any particular dish. It's knowing that I can come in any time, any time at all, and know what's coming out is going to be just absolutely splendid. So Chef, consider adding this sandwich to the regular menu. And patrons, take advantage of that $12 deal this week. See if I'm right. I bet I am. You'll find The Capital Hotel at 111 West Markham downtown. Check out the website for Capital Bar and Grill here.